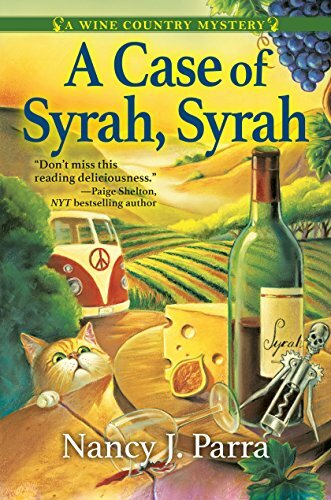 In A Case of Syrah, Syrah, author Nancy J. Parra sets the scene for a good cozy mystery. Taylor O’Brian lives with her Aunt Jemma and helps run Jemma’s small winery in Sonoma County, California. Itching for something more to do, and with a marketing degree behind her, Taylor establishes Off the Beaten Path Wine Country Tours. Members of her first tour include a small group of yoga instructors, but all does not go well. When Laura, the leader of the group and owner of a local yoga instruction studio is found dead, with Taylor’s corkscrew in her neck, fingers start to point, and they all point toward Taylor. When Taylor is indicted for the crime, but freed on bail, she does not sit still waiting for the handsome sheriff, Ron Hennessey, to solve the problem. With the help of her best friend, Holly, and Aunt Jemma, Taylor begins the search for the real killer. Unfortunately for Taylor, she is more adept at pouring a glass of wine than she is at solving crimes and clearing her name. In spite of repeated warnings from her lawyer, Patrick, and Sheriff Hennessey, Taylor believes it is up to her to find the real culprit. Parra provides the reader with a multitude of possible perpetrators, and Taylor and Holly find themselves investigating each and every one. Even when it seems that each has a solid alibi, the ladies continue their search. And just when it seems that they have reached a dead end and Taylor’s fate may be time in prison, another victim shows up. Ivy, Laura’s sister-in-law turns up dead, with Taylor in the middle of the crime. One more victim and one less possible perp! Again, the warnings from her lawyer and the sheriff go unheeded, as Taylor, Holly, Jemma, and newswoman Chelsea continue their search. If life could not get any worse, new crimes roll down the hill—Taylor’s new puppy, Millie, is dognapped and held ransom for $10,000 and Taylor discovers an identity theft crime ring that appears to have close ties to Laura and her yoga instructors. With each step forward, Taylor and her team seem to take two steps back, with Patrick and Sheriff Hennessey unable to stop Taylor’s search for the truth. Progress in the investigation slows to a stop, with no movement in sight, until Holly is kidnapped. At that point the story moves rapidly to its successful ending. Parra provides the reader with many twists and turns, and a satisfying solution. This is a good book to curl up with on a cold winter night—and don’t forget a nice glass of Syrah!